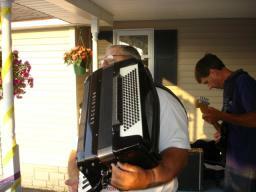 Fred straps on his Excelsior, while Frank gets his Fender ready, as they prepare to play Tuffy's Polka, on June 17, 2007 in Waterville, NY. George, Frank, and Gabe are pictured here cranking out a tune on June 17th. 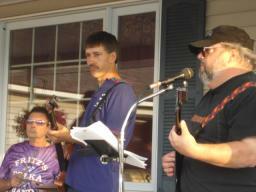 Fritz is shown here in Waterville, NY with Jim Barnes during FPB's third set, as Jim jammed on a few tunes with FPB. Gabe, George, and Jim enjoy each other's company during a break between FPB's second and third set on June 17, 2007. 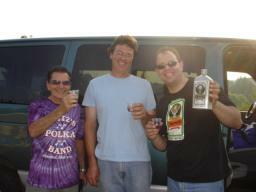 George, Jim (FPB's good friend and recording engineer), and Fritz toast some Jagermeister punch on June 17th. 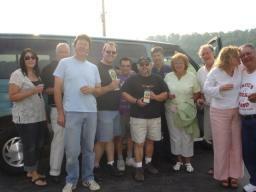 The guys in FPB make a toast with some Jagermeister punch with their good friends, members of the Barnes family on June 17, 2007 in Waterville, NY. 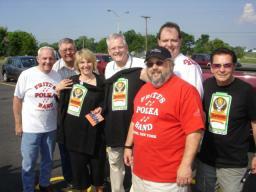 The guys in FPB are shown here with Sandy and Bud at the conclusion of Sandy and Bud's surprise 40th anniversary party on June 16, 2007 in Seneca Falls, NY. Tom and Fred are shown in action during FPB's second set on June 16th. The guys toast some Jagermeister punch prior to their first set on June 16, 2007 in Seneca Falls, NY. 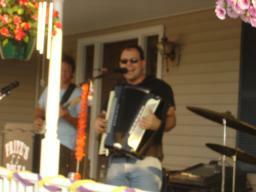 George and Frank are shown here prior to the start of FPB's second set on June 13, 2007 in Whitesboro, NY. Gabe is pictured here with his Parker bass on June 13th in Whitesboro, NY. 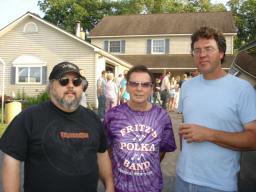 Frank, Fred, and Fritz are shown here during FPB's gig in Whitesboro, NY on June 13th.